If you are not on our mailing list, send us an email - we have some fun events coming up! 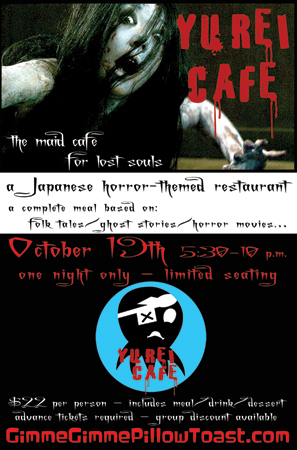 Yurei Cafe - A one-night Japanese horror-themed restaurant! and horror movies. Vegan/gluten-free option available! 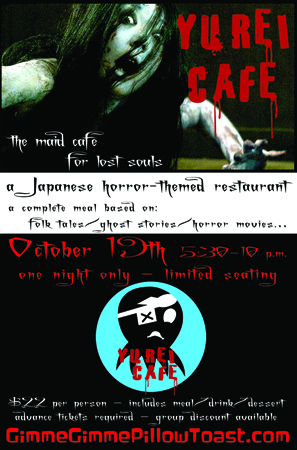 October 19th 5:30-10 p.m. There are two seatings - one early, one late. $22 per person - includes gourmet meal (multiple choices) + drink + dessert! So sorry - both seatings are sold out! Please email us to get on a waitlist for cancellations and/or to be notified about future events! Our temp store at Mod Livin' in 2012!